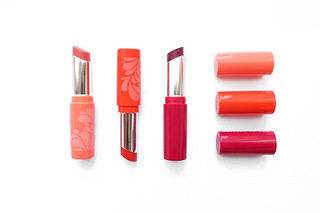 The Lipstick-Lipbalm hybrid isn't exactly a new invention but the Pop of Passion Oil-Balms knock the likes of Maybelline's Baby Lips out of the park. Retailing for £16 each something more than your average tinted lip balm is naturally expected but bareMinerals really have delivered here. 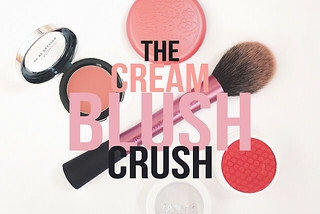 Not only are the Oil-Balms nourishing with one of the smoothest, creamiest formulas I've ever came across (they actually melt onto the lips) they're also surprisingly pigmented and leave a beautiful sheen to the lips without feeling sticky. The key to their success is the oil enriched formula: packed with Passion Fruit Seed Oil and Vitamin E the moisturising abilities are far superior to your average lip balm and the oil-based formula really helps with application. My lips are always leaning towards the drier side so my biggest issue concerns pigment clinging onto the drier areas of my lips so I was thrilled that the Pop of Passion balms didn't have this problem! Instead the balm glides across the lips and even managed to conceal these pesky problem areas. No miracles occurred with hydration but my lips were noticeably softer, smoother and more moisturised after application. 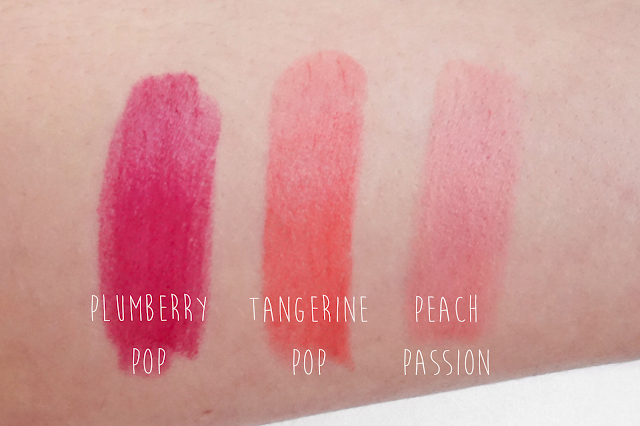 Heavily Swatched (2 layers) of Plumberry Pop*, Tangerine Pop* and Peach Passion. One layer of Peach Passion, Tangerine Pop and Plumberry Pop. You can see the gloss here! At the moment Plumberry Pop is my go-to Autumn lip colour and out of the 3 Pop of Passion Lip Oil-Balms that I own it's probably the one I'm most impressed by. From my experience the Pop shades are definitely the most pigmented and as far as longevity goes they have the longest staying power as they tend to have a stain-like effect and linger on the lips even when the glossy finish begins to fade. I find Plumberry Pop so versatile - if I'm not feeling that bold I apply a tiny bit to my finger and lightly rub the balm across my lips for a flush of colour. However, if I really want to rock a darker berry lip I find Plumberry Pop does the job beautifully. I personally find it much more comfortable to wear than a lipstick and the Oil-Balms fade evenly (something that is so hard to find with darker shades!) Tangerine Pop acts in a similar fashion to Plumberry - it's just slightly less stain-like due to the lighter, less rich colour - and on my lips it transformed into a lovely coral shade. For such a light shade (possibly the lightest of the collection) Peach Passion has seriously impressive staying power. It doesn't seem to have the stain-like quality of the Pop shades but it certainly hangs around a lot longer than your average tinted lip balm. As well as feeling soft and truly comfortable on the lips it also looks gorgeous and I'm so in love with this shade of peach. It can be built up into quite an intense pop of colour too if you apply a couple of layers. If you're looking for something a little more forgiving and more nourishing than a lipstick whilst not sacrificing pigmentation then I cannot recommend the Pop of Passion Oil-Balms enough. The packaging is adorable too and they're so handbag friendly and easy to apply on the go. 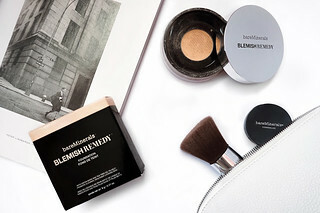 You can pick them up from bareMinerals online here for £16 each or from Feel Unique who currently have them on offer for only £12.80! *This post partly contains PR samples.